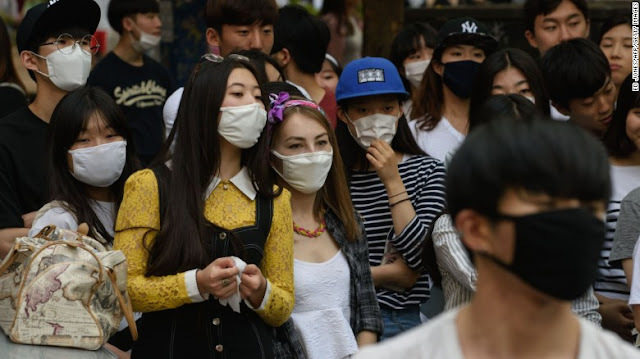 Seoul, South Korea (CNN)Fears of MERS in South Korea are growing by the day, with more than 2,300 people quarantined as the country grapples with the outbreak.More than 1,800 schools will be closed for several days amid concerns of the spread of Middle East respiratory syndrome. They include at least 1,255 schools in Gyeonggi province, the area outside Seoul where the outbreak started and where a South Korean air force member stationed at a U.S. air base has been isolated with the illness.Other closed schools are in the Gangnam region, near the Samsung Seoul hospital -- the most affected hospital in the city.In total, 87 people have contracted the virus, and six people have died, according to official numbers. MERS is in the same family of viruses as SARS (severe acute respiratory syndrome -- coronavirus) as well as the common cold. The virus acts like a cold and attacks the respiratory system, the Centers for Disease Control and Prevention has said. But symptoms, which include fever and a cough, are severe and can lead to pneumonia and kidney failure. Gastrointestinal symptoms such as diarrhea have also been seen, according to the WHO.